The Mission and Ministry Center is offering a two day immersion Tuesday Feb 7 - Thursday Feb 9. This immersion is an opportunity to gain a deeper awareness of the complexity and history of Oakland—primarily through a lens of its rapidly evolving gentrification and development. Gentrification is a growing phenomena that is usually associated with the larger U.S. cities and neighborhoods (i.e. New York, Chicago, etc. ).The changing realities of gentrification have mixed reviews: for some its seen as a boon for cities and for others it means a harsh reality of displacement. Our hope with this immersion is to have a transformative educational experience that instills a greater sense of these complexities around gentrification in Oakland as we partner with the efforts of those who are working daily for social justice in West Oakland. What am I actually going to do on this immersion? Although Oakland is only 20 minutes from Moraga, we will immerse ourselves in a completely different setting by staying at St. Vincent De Paul in West Oakland. 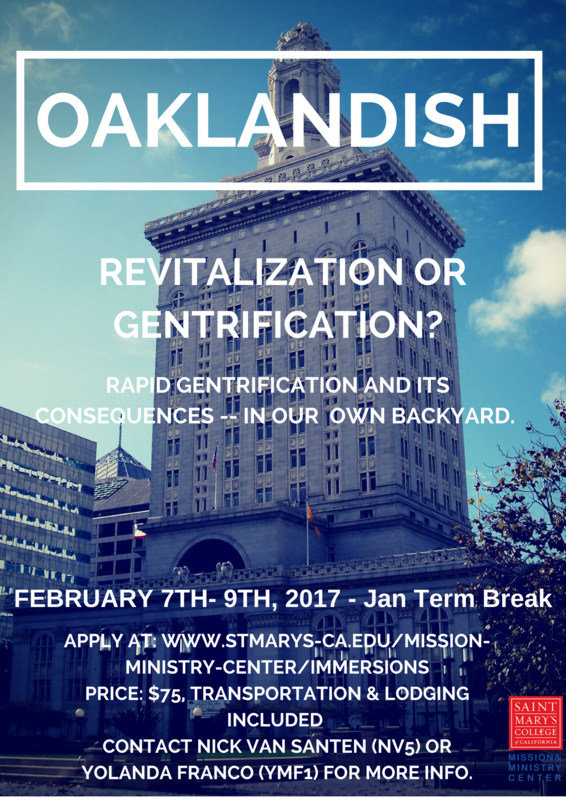 We will stay and serve in their facility as we engage with those who are experiencing the complexities of gentrification in Oakland. There will be time to reflect, build community with your peers, and to really explore a pressing and real issue present in our own backyard. Why would I want to go? This immersion truly offers an opportunity to grow in understanding and empathy to one of the many complexities and challenges of our environment. Alongside learning about the realities of gentrification, you will also be better equipped with first hand experience to critically examine how gentrification intersects with issues of class, privilege, and race. We invite you to come and challenge your thoughts and knowledge about gentrification within a community of your peers. Plus, SMC students usually experience new friendships from our immersive experiences.